The art of typography has held an active role in shaping society for centuries, paying no heed to the medium by which it is produced. Oftentimes drawn by hand, elegant scripts populate numerous old texts and published works that still exist to this very day. While the production process and longevity of typefaces, known as “fonts” by modern standards, have changed significantly, some appreciation for the more idiosyncratic examples still exists. More importantly than simply being distinctive, however, a font must serve a purpose. Many modern typographers exhibit intense purpose in their choice and application of typeface. 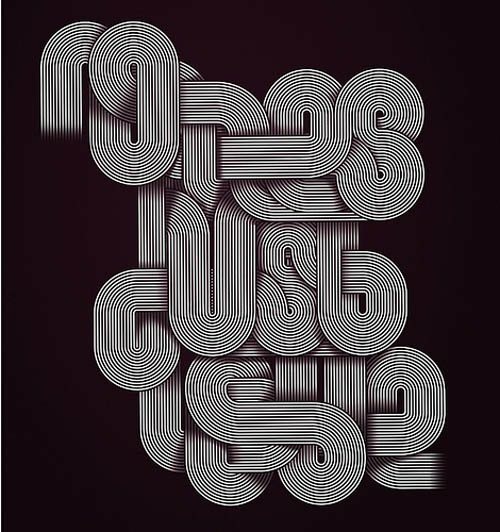 In “NoLiesJustLove,” the artist, Jordan Metcalf, uses a seemingly continuous typeface to present the philosophy that honesty and love are not only connected but inseparable; without one, the other would be incomplete. A black-and-white color scheme most likely symbolizes the objectivity of truth, while the lack of a background image indicates the severity of the issue. Stayros til Georgakopoulos presents a chaotic image in “AstheWorldMyEyesSee:” a medley of fonts and colors designed to shock and awe the audience. The primary focus of the piece, a diagonal incline from the bottom left corner to the top right corner, is indicative of a feeling of movement, and is presented using a harmony of both images and text. 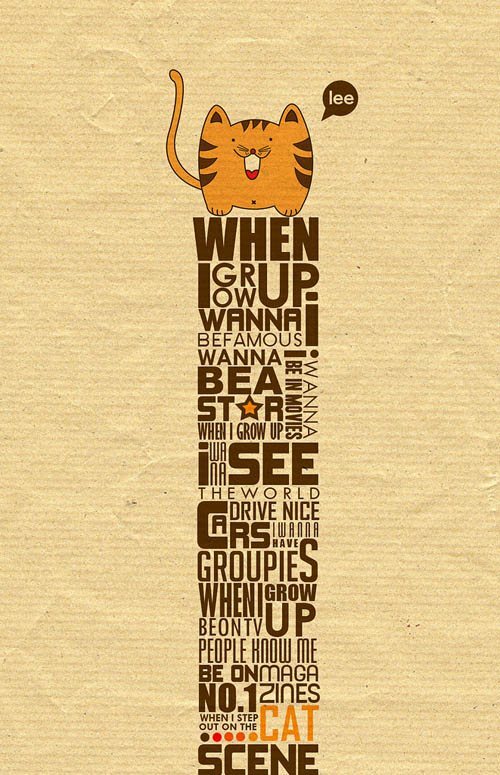 “WhenIGrowUp,” created by Lee Huynh, adopts a rather simplistic typeface in an ornate arrangement to convey a sense of clear-cut indecisiveness. 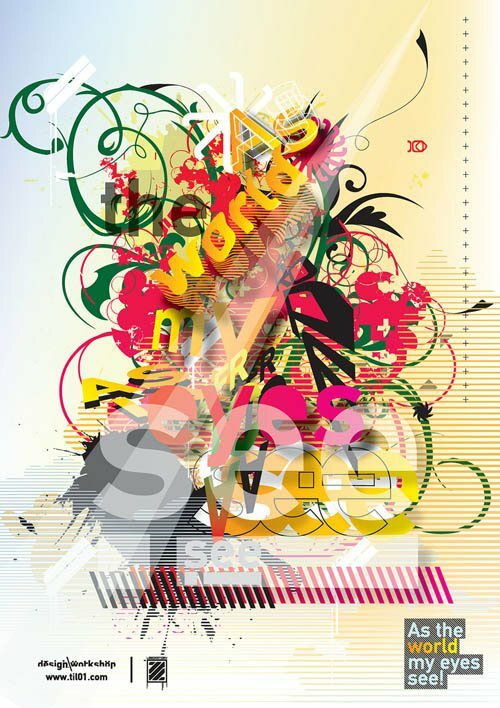 Crowded arrangement, combined with small text, portrays an image of a swift-moving mind. Using a kitten, the column of text presents the shape of an “I.” This shape, combined with the racing thoughts presented within the shape itself, presents a motif of uncertain self-set goals that motivate an individual to explore all options possible. 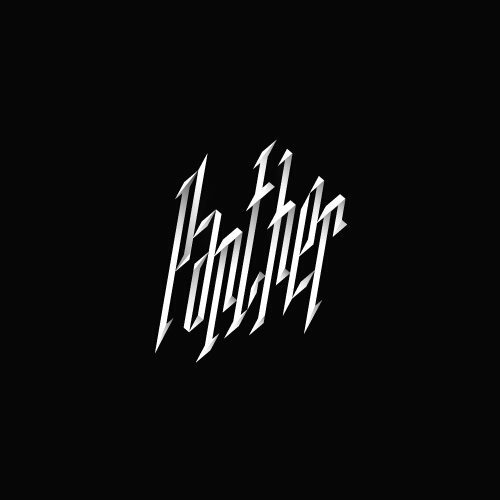 Kliment Kalchev uses a stark contrast and fine chiseled text in an attempt to present a bold presence, such as the “Panther.” The text, seemingly italicized for emphasis, is oriented along a diagonal line. Again, diagonal lines generally symbolize movement and energy- an idea that certainly fits the modern perception of the panther. A thinner typeface is used to further emphasize the contrast between black and white, since more surface area creates the illusion of starker differences in color and texture. 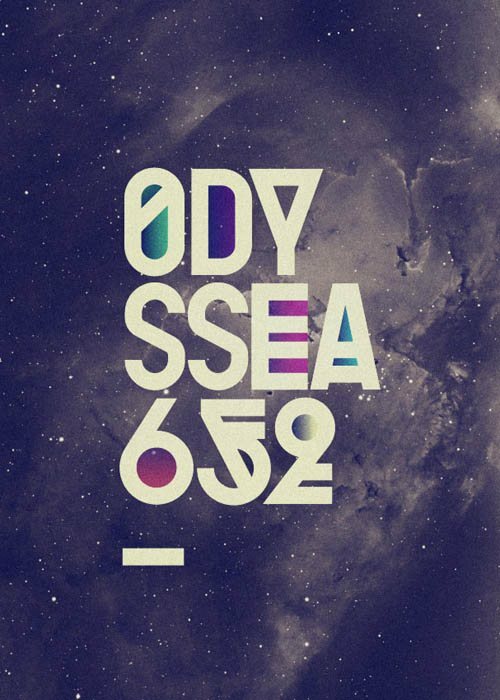 Pablo Alfieri clearly strives for a space feel in his “Odyssea 652,” as presented with his choice of background and color. The combination of both color palette and font seems to allude to a more romanticized version of space, an idea further emphasized by the starry background and overall scope of the picture. Typographical choices seem to allude to a presentation dealing with extraterrestrial existence. This is a fine example of using pop culture standards to present an idea: fonts of this sort are commonly associated with alien life. All of these examples exhibit a clear mastery of not only the medium used to present the idea but also of the components used within the artwork. A distinct choice in typography, combined with a clear color scheme and intense message, takes only a few seconds to tell a story that could otherwise take hours, and to leave an impact not otherwise possible. With a strong impact, any idea can be relayed to the masses.